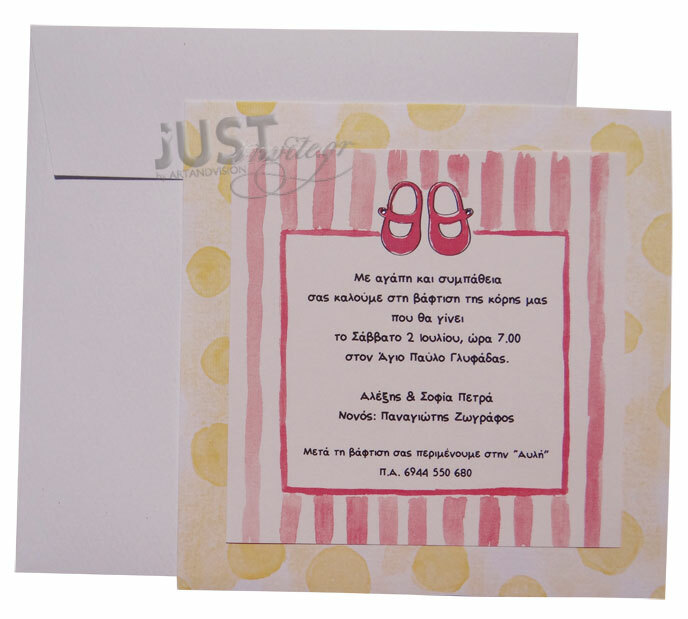 Cute Greek Baptism invitations with baby shoes for your little girl coming in a card with a baby shoes pattern in fuchsia and yellow colour and strass beads attached to it. The matching envelopes are square white paper and your personalised wording is printed in plain grey colour. Size: 17 x 17 cm. https://www.preciousandpretty.com/2017/04/christening-invitations-with-baby-shoes-for-girl-C907.html Greek Wedding Favors|Orthodox Crowns|Stefana|Baptism Invitations Christening invitations with baby shoes for girl C907 Greek Christening invitations with baby shoes for baby girl Product #: Greek Wedding Favors|Orthodox Crowns|Stefana|Baptism Invitations_4675381605343780936 5 stars out of 5 reviews.